Mortal Kombat vs. DC Universe is a crossover fighting video game between Mortal Kombat and the DC Comics fictional universe, developed and published by Midway Games (their last entry in the franchise before they would go bankrupt in 2009 and sold the franchise to Warner Bros. Interactive Entertainment). The game was released on November 16, 2008 and contains characters from both franchises. Its story was written by comic writers Jimmy Palmiotti and Justin Gray. Despite being a crossover, the game is considered to be the eighth installment in the main Mortal Kombat series, as evidenced by the naming of the tenth entry by this count: Mortal Kombat X. The game was followed by a Mortal Kombat reboot in 2011 and by Injustice: Gods Among Us in 2013. The game takes place after Raiden, Earthrealm's god of thunder, and Superman, Metropolis' defender, repel invasions from both their worlds. An attack by both Raiden and Superman simultaneously in their separate universes causes the merging of the Mortal Kombat and DC villains, Shao Kahn and Darkseid, resulting in the creation of Dark Kahn, whose mere existence causes the two universes to begin merging; if allowed to continue, it would result in the destruction of both. Characters from both universes begin to fluctuate in power, becoming stronger or weaker. Mortal Kombat vs. DC Universe was developed using Epic Games' Unreal Engine 3 and is available for the PlayStation 3 and Xbox 360 platforms. It is the first Mortal Kombat title developed solely for seventh generation video game consoles. 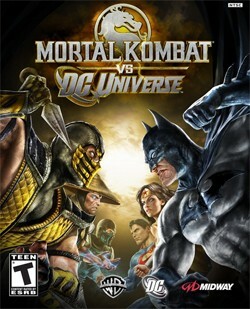 Most reviewers agreed that Mortal Kombat vs. DC Universe was entertaining and made good use of its DC Universe license, but the game's lack of unlockable features as opposed to past installments of Mortal Kombat and toned-down finishing moves garnered some criticism.